Let me sum up: I learned a lot. I've had instructors tell me about this before, but I never really "got it." I've been spoiled by powerful, understeer-biased road cars that allowed me to over-slow into turns, balance the car in the turn with my right foot, and power out - and still turn respectable lap times. This is a safe technique, and is good for the street where you aren't completely familiar with a given series of turns. But it isn't truly fast. If you have to reduce the amount of acceleration at any point in the turn to stay on line, you are not going to come out as fast, and should have entered or begun accelerating more slowly. I will never drive my cars as close to the limits as I did at this school. 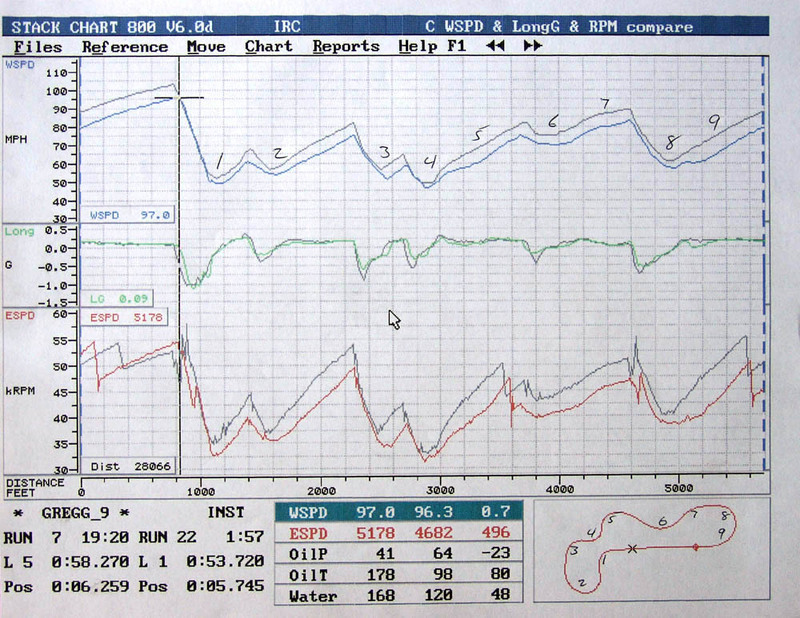 But especially with less powerful cars, momentum is everything, and in a neutrally balanced or oversteering car, constant acceleration really plants the rear end. The goal is to slow only and exactly as much as necessary through a combination of straight-line and trail-braking, then get on the gas early, and stay on it. Once you're really dependent upon the acceleration to keep the rear from coming unglued, though, you cannot lift until you're straight, or you will almost certainly spin. It takes guts, because you have to commit at point A, knowing you can hold the throttle on until you reach point B, which may be several turns away! On this track, you sacrifice the line in 3 to get a good entry to 4, sacrificing the exit to set you up for 5. 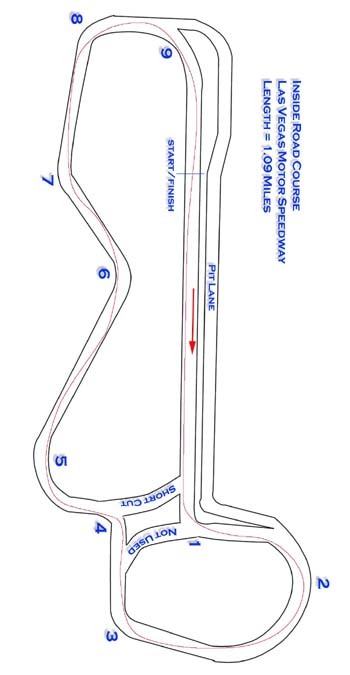 Full throttle is rolled on between turns 4 and 5, and held on until you straighten track right, just before Turn 6. You lift for a moment (no brake), turn in and roll the gas back on before the apex, remaining at full throttle through 7 and into the braking zone at 8. The faster you are out of 3, the faster the rest will be, to the point where you will absolutely be at the limit through 5, 6 and 7. But at these speeds, if you miss the apex of 6 or 7, or try to go through either without a lot of throttle, you will go off. Period. I repeat: If you have to reduce the amount of acceleration at any point in the turn to stay on line, you are not going to come out as fast, and should have entered or begun accelerating more slowly. That is commitment, and is the real meaning of "slow in, fast out". This isn't news to me. Every class I've ever taken stresses the importance of looking ahead, using peripheral vision to hit an apex or other mark. And time and time again, I've done this consciously and instantly seen the benefit. Yet it is one of the hardest habits to get into. There is some natural animal instinct to focus on the cone you're aiming for until it has passed, or to stare at (and follow, sometimes right off the line) the car in front of you. It is called "target fixation" - and it is a bad thing. You go where you look. To this day, however, I still find I have to be conscious about this skill - when I do it, my driving is better. When I relax, though, I still forget sometimes and that instinct takes over. The costs and benefits were both demonstrated to me again in this class, perhaps more dramatically than ever before since we were so much closer to the limits. Although I wasn't consistent at it, I tried to make it part of my self-talk patter: "track out, spot the braking point, line up, spot the apex, brake, spot the exit point, turn in, on the gas, spot the next turn entry, track out...." You start looking for the next point before you pass the closest one. Saying it out loud can serve as a reminder and help establish a rhythm. I got better at this - but I sure wish it came naturally! 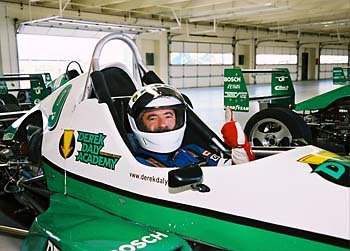 Another lesson I learned was the value of discipline in learning slowly, focusing on doing all the right things on the right lines, slowly advancing braking and throttle points. I am a devout instant gratification junkie and my habit has been to charge hard using the "demon braking, power out" approach I described above. 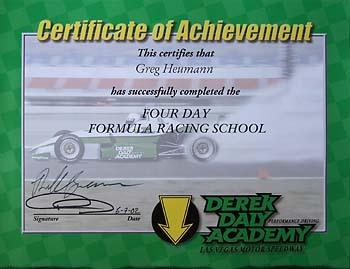 I was indeed the fastest driver when we started, but two other students were turning slightly better lap times than me by the end of Day 4 for this very reason. Unlike my previous instruction, however, this course provided both the structure and the time to focus on a few skills at a time and develop them. This is the most discipline I have ever applied, and it worked. Had I to do it over again, I would have been even more patient and just a little slower but more accurate in the earlier sessions. It was fascinating to lap together, because one guy would almost always be faster in one section, only to be caught up by the other at a different part of the course. We analyzed and discussed each others' techniques to our mutual benefit. My fellow coconspirators, Bart (l) and Andy (r). The course provides an extremely safe environment in which to learn. There was always safety equipment, including fire/tow truck and ambulance standing by at the track. The cars are well equipped in this regard, and the tracks provide plenty of runoff room almost everywhere. Of course there were a few spins and offs, which resulted in the instructors (and one of the school mechanics who assisted) driving over to the off-track driver, making sure the driver and car were OK, and yellow-flagging the area. This meant there were usually a few laps each session when we couldn't judge our efforts through lap times, but this was unavoidable and didn't detract from the experience. Nobody was hurt in any of these events, and there was only extremely minor car damage. This is a pretty safe track at which to learn. Classes will be run rain or shine. Las Vegas weather is almost always dry, but it can get very, very hot, with temperatures well over 100 degrees in the summer. We ran May 21-24, and lucked out with absolutely perfect weather, which was about 10 degrees below the average for this time. Still, temps were in the low 80's (I think), and these are open cars. You're actually pretty well covered up in the Formula cars, but the Z3's are wide open. The class includes water bottles and plenty of water - be sure you drink it. Nevertheless, I think I would be inclined to schedule a class in the spring or fall. 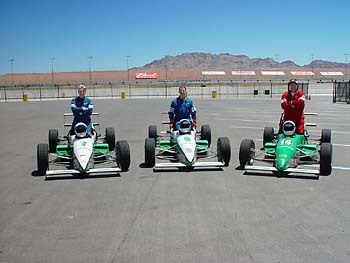 Anyone can attend this class, however some on-track experience would be a definite bonus. If you don't have at least some familiarity with skills like threshold braking, spin prediction and correction, and understand the effect of throttle and brake on a cars' tendency to oversteer or understeer, I would encourage you to attend a "driving school" program first, and save this for later. Although there is a session in the Z3's dedicated to practicing heel-and-toe downshifts, you'd be wise to begin learning before you get there as well if you don't already know how. A few students were frustrated trying to master this skill while some of us were already focusing on other skills - and it cost them a second or more a lap. Any time you're on a new track, instructors are going to relate everything to the course's turn numbers. Although you can (and should) memorize the track map, the actual course will always look different. The best thing you can do is watch a video of someone lapping the course you're going to drive, over and over, saying the turn numbers out loud until you can visualize a "virtual lap" around the course, knowing each turn by number. Before the class, I searched the web to no avail looking for such a video. I also called to see whether the school could provide a video, and they said they didn't have anything. 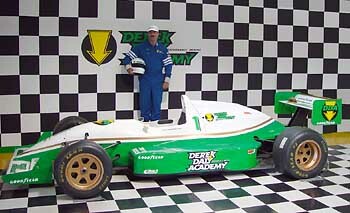 I was surprised when on Day 3 the instructors showed us a video taken from an F2000 car lapping the inside road course. So maybe if you beg.... 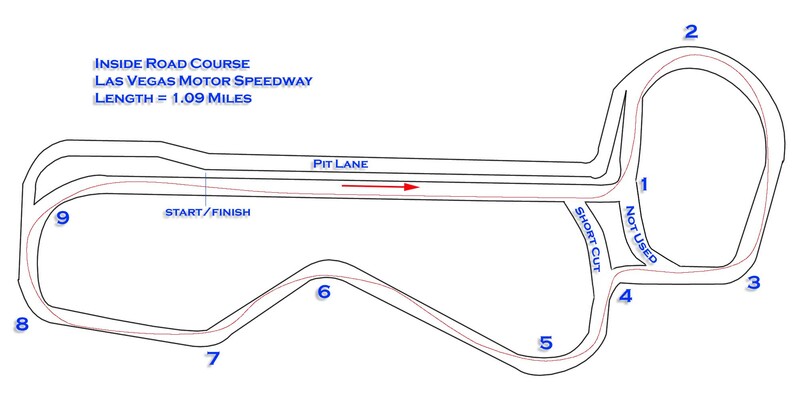 I should also point out that they occasionally run the class on the "outside road course", which is near the technique oval. When we were there, the outside road course was being used for police pursuit training, as well as an all-women's motorcycle racing class. Make sure you don't study for the wrong course! I cannot praise this course enough. It was fun, safe, and effective. It provides a structured approach to developing advanced skills, with each new step building upon the last, and plenty of time to practice each. The instructor-to-student ratio is very good (we had 6 students and 2 instructors in our class), and both instructors were not only talented drivers, but helpful, articulate and insightful teachers with good senses of humor. My friend Bart said "The instructors, Rich and Jeff, were great! They were constantly throwing in some humor that, to car guys, was really funny. And they even took all our pokes and jokes as part of the experience. Not stuffy at all and at the same time, very good, pointed instruction. There was not a question they couldn't take care of. " 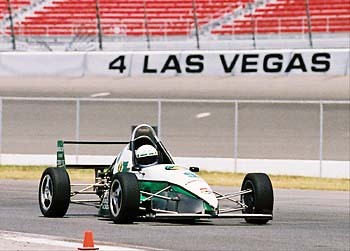 The truth is, my primary goals were fun, and to drive an open wheel racer. I achieved those goals, but came away learning more than I expected as well.